Starting on Thursday, Feb. 8, 2018, Houston’s airports became even more accessible for travelers who are blind or low vision. Now, at both George Bush Intercontinental Airport and William P. Hobby Airport, subscribers to the Aira service will be able to use the technology free of charge. The two Houston airports are the first in Texas to join the Aira Airport Network, and just the third and fourth in the country to do so. Under the agreement, the Houston Airport System has agreed to cover the cost of minutes used by Aira subscribers within the airport terminals through the end of 2018. The Aira app and smart glasses connect travelers to a specially trained agent at a remote location, who sees a real-time livestream from the camera on the glasses or smart phone. The agent narrates what is in the user’s field of vision, assisting them with such tasks as navigating the terminal, locating and identifying luggage, reading flight boards, dining and shopping, and arranging ground transportation. “Aira is a unique technology that gives users the information they need when they need it, and we are delighted to be able to offer this convenience to our passengers,” said Tim Joniec, the Americans with Disabilities Act Coordinator for Houston Airports. 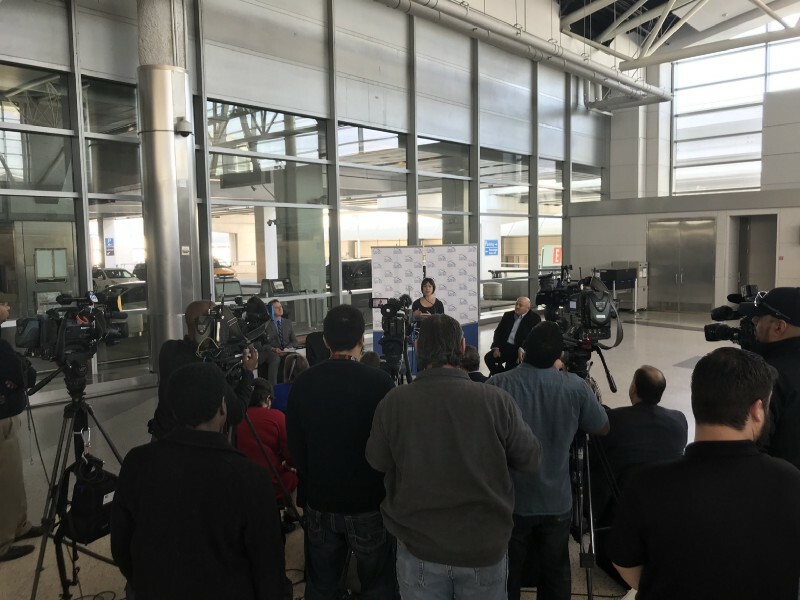 Christine Ha speaking to a number of television cameras and reporters at Bush Intercontinental Airport. The National Federation of the Blind and the American Foundation for the Blind have been staunch supporters throughout the development of Aira. Christine Ha, Houstonian, Aira user and a New York Times Bestselling Author who was the winner of MasterChef, Season 3, uses the technology to travel frequently through the Houston airports, and recently visited the airports to demonstrate how the technology works, along with Aira and airport executives. To celebrate the launch of the latest addition to the Aira Airport Network, we are offering a free 30 day trial of Aira to all new Texas Aira Explorers! The first 50 Texans to sign up prior to 11:59pm CST on Sunday February 11th will be eligible for this promotion.